When we first saw the new Wii U controller, many people were quick to notice the similarities between it and the Apple iPad. We also pointed out a few of them ourselves. But our more recent article shows that the Wii U was being discussed just after the Wii was launched. Many are skeptic on whether the Wii U controller was copied off of the iPad, but Miyamoto has now revealed that the idea of the Wii U’s tablet controller was not inspired by Apple. In fact, the company was surprised when the tablets started to become popular, since it started just before Nintendo was preparing to show the device. Actually it was coincidental, because even at this point last year at E3, we had done a lot of work on this, and it was pretty far along, and we had been working on the concept for several years,” he said. “We felt it was kind of a funny coincidence that, while we had been working on this, all of a sudden right as we’re getting ready to bring it to the public, there’s this tablet boom. “On the one hand we felt that if we were to show it off at E3 last year, then people would look at it and say, ‘Oh, it’s like a tablet.’ But on the other hand, it may have actually helped us because it made it easier for people to understand the concept,” he added. 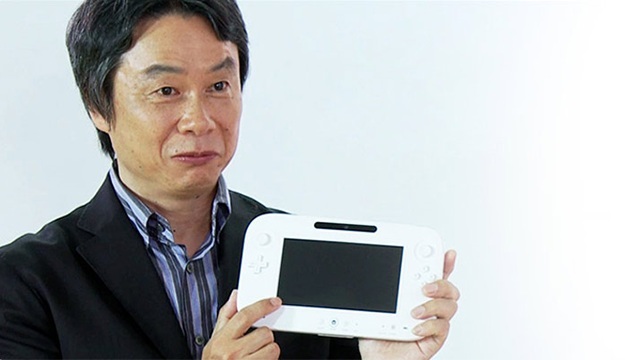 I can agree with Miyamoto about revealing the Wii U in this year’s E3 instead of last years. With the iPad, many people would have looked at it as just another tablet. Also, with the revealing of the 3DS, I don’t think I could have survived from excitement at a new console as well. It also gave them more time to perfect its concept, and be able to show it in more detail. I’ve probably said this before, but I am a student earning a Bachelor’s Degree in Game Design and Simulation. This new type of controller really opens up a new type of gameplay, and I am looking forward to what they can accomplish with it. I do see the similarities, but the Wii U interacts with your television in ways the other tablets can’t. I do not own an Apple iPad. We bought one for my cousin for her college graduation, and she seems to love it. Sadly, she isn’t a gamer, at all, so it’s pointless for me to pester her about this sort of topic. Plus, she’s in Hawaii right now. I am jealous. Are there any of you who own one, and can give a comment about this sort of gaming experience? I’d really appreciate some opinions on gaming on an iPad.